With only a few exceptions, this has been number for tight ends since the inception of the franchise back in 1976 and our best-ever was one of the best the Bucs have had at the position. The first person to wear the number, Fred Pagac, went on to become linebackers coach of the Vikings and did a great interview for this site on the expansion Buccaneer project. He was followed by a series of no-names until Jerry Bell came along in 1982. 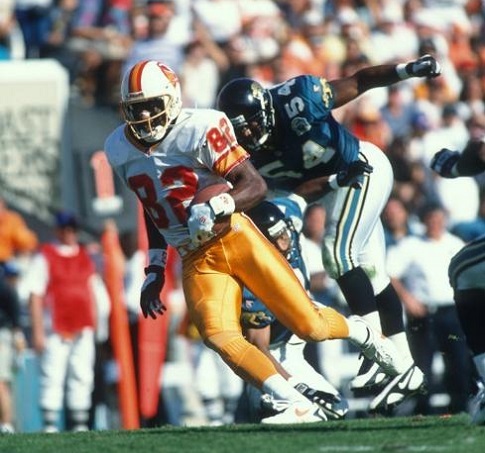 After Bell's unfortunate injury problems in 1985 and 1986 that ultimately caused his retirement, the Bucs needed to draft a tight end and went looking for one in 1987 out of the University of Hawaii. 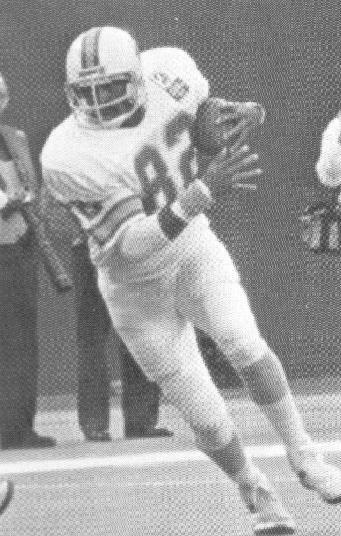 Sadly Ron Hall passed away in 2007 at a tragically early age, but his seven years in Tampa Bay saw him become a real fan favourite and reliable steady presence at tight end. 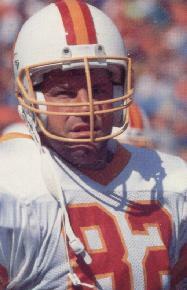 Jerry Bell has become a very good friend to BUCPOWER.COM and had a great career sadly cut short by injury. Tyree Davis led NFL Europe in receiving in 1995 but could not make it into a decent NFL career and the less said about Alvin Harper the better. Some more recent Buccaneer converts may just look at stats and think that Kellen Winslow should have won but Ron Hall's career was a lot longer and more productive all-round to the franchise than the times when K2 decided he would make the effort on the field to run the right route.